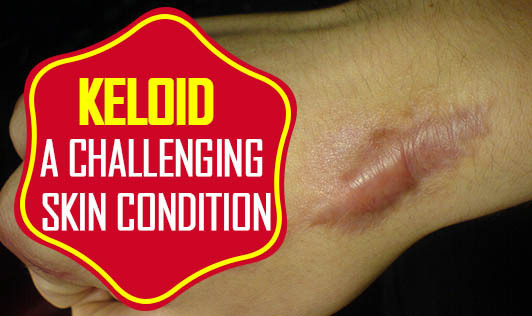 A Keloid is a raised overgrowth of scar tissue that develops around a wound, usually after the wound has healed. The exact cause is unknown but this usually develops after acne spots, boils, burns, body piercings or surgical wounds. Keloids are one of the most challenging dermatologic conditions to successfully treat and can have significant amount of psychosocial burden on the individual. They generally occur between 10 and 30 years of age. Though not medically dangerous, it could affect the appearance of an individual. Sometimes, they may become smaller, flatter and less evident over a period of several years. Genetic factors, hormones and problems with the immune system have been suspected to be involved. You cannot stop a Keloid from occurring but you can avoid getting any deliberate cuts, breaks in the skin such as tattoos and piercings including the ones in the earlobes. Experts say that people with dark skin develop Keloids much more easily than people with lighter or fairer skin. There are treatments available to get rid of them, but it can be difficult because they do not give complete satisfying results. Treatments may work best soon after the Keloid appears. Keloids are cosmetic problems and do not become cancerous. Once it stops growing, it remains stable unless and until the area is wounded again. If a scar becomes itchy, enlarged, interferes with movement of a joint, or develops new symptoms, please get in touch with your doctor.